Nicknamed as the “City of Palms”, Fort Myers is located in Florida. With long stretches of gorgeous coral beaches, it is one of the most popular tourist destinations in the state. If you’re looking for the perfect beach holiday this summer, book a cheap flight to Fort Myers. The city has been named after the Jewish American Army Officer, Abraham Charles Myers. The city has a total area of 40.4 square miles. The climate of this city is tropical as about 8.6 miles out of total area is water. The city experiences long humid summer season and short warm winter season. It also experience heavy rainfall from the month of June to September. Famous for its nightlife, Fort Myers has a number of lively bars and lounges for you to explore during the trip. Some of the most popular ones are — Space 39, City Tavern, 8 Ball Lounge, Cowboy Up Saloon, The 86 Room, Romance Night Club and Fantasy's At the Beach. Hop-on a low cost flight to Fort Myers for an amazing vacation. The closest airport is Southwest Florida International Airport. The second major domestic airport used by visitors of Fort Myers is Charlotte County Airport, just 24 miles away from the city. 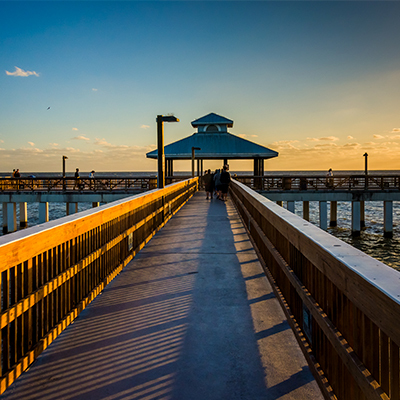 The best time to visit Fort Myers is during both — spring and summer season. Lakes Regional Park- Lakes Regional Park is located along Gladiolus Drive. This 279-acre of land is also known as Lake Park. This park is named Lakes Regional Park due to the fact that the park comprises of several man-made freshwater lakes covering an area of 158 acres. The park features a number of beautiful trails perfect for visitors to stroll around at. It also has a few biking trails. A great spot for bird-watching, the park is home to other small wildlife species as well. Its most loved features are the butterfly house, fragrance garden and children’s playground. Imaginarium Museum and Aquarium- This is a science centre which is loved by visitors of all ages. The museum is home to many species of small animals and birds. Among its collection are dinosaur fossils. The gorgeous aquariums filled with bright colourful fishes make it mesmerizing. The most favorite of exhibits are the touch tanks that allows visitors to interact with live fishes. Book a flight to Fort Myers to visit this intriguing museum. Hammond Stadium-The Hammond stadium was built in the year 1991 in South Fort Myers. This stadium is a baseball field operated by the Lee County. This huge baseball stadium is located in the CenturyLink sports complex. Hammond stadium can accommodate more than 9,000 spectators. In 2014 and 2015, some major renovations were done, making it the grand place it is today. Edison and Ford Winter Estate-The Thomas Edison Estate and Henry Ford Estate were built in the year of 1886 and 1915, respectively. These estates were initially built as vacation homes for the winter season. At present times, the estates feature ­­historical museums and a botanical garden covering an area of 21 acres. The botanical garden of Edison estate contains different variety of flora from all around the world. Lookupfare, a leading travel portal brings you a wide range of flight deals along with a host of other services that goes a long way to make your vacation special. While booking flight tickets to Fort Myers, you’ll find that Lookupfare provides special travel deals such as Senior Travel Deals, Last Minute Travel Deals, Group Travel Deals and Family Travel Deals. Go through our website or app to find the travel deals that best suit your travel requirements.